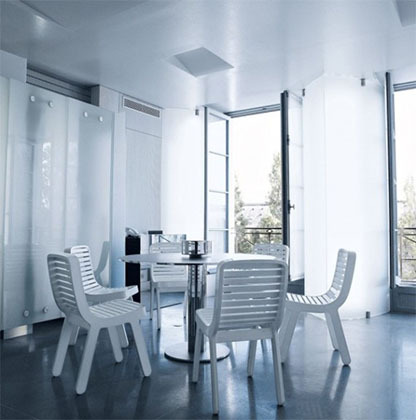 One would expect Karl Lagerfeld, one of the most prominent forces in fashion design and the man behind the legendary house of Chanel, to own an apartment in France that reflects the sophistication and uniqueness of Parisian culture. Instead, these series of photos of the designer’s Parisian apartment shows a place that possesses a cold, sleek and industrial aesthetic. Consisting of grey walls and black furniture to plastic lounge chairs and frosted glass panels, the apartment appears to be a reflection of the designer’s own sleek appearance and famously cold personality. A spacious living room with retractable glass walls contains Kaiser Karl’s personal library, said to number up to 40,000 books. Check out the rest of his apartment through the pictures above.